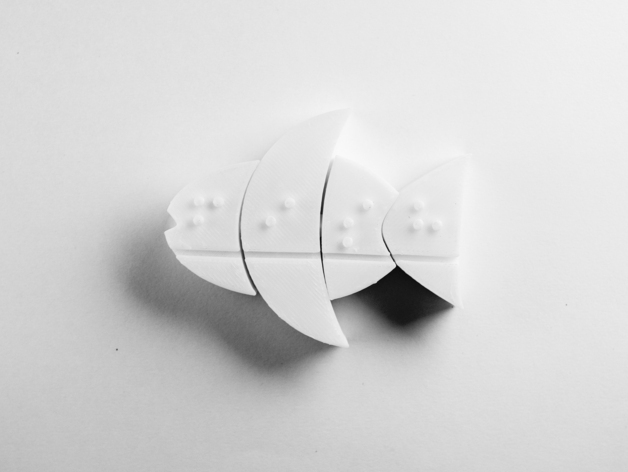 Fittle Fish: 3D Printed Learning Tools for the Blind « Adafruit Industries – Makers, hackers, artists, designers and engineers! For example, the word “fish” is constructed by joining together 4 puzzle blocks that have braille letters F-I-S-H embossed on them. Each block has an outward and inward connector socket. The visually challenged kid fits together the blocks through these sockets by feeling and putting together the right contours of the blocks, which only fit the right match. The blind child fits together the blocks by feeling and matching the right shapes. A line engraved at its bottom ensures that the letters are aligned. The kid is able to read the word “fish”. Next, the kid feels around the contours of the entire block, to understand what the form of a fish is. See more and find more Fittle designs on their Thingiverse page!